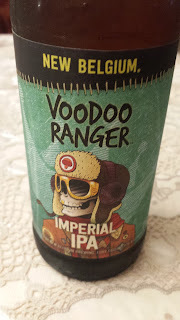 This is another of the New Belgium extra hoppy beers in the Voodoo Ranger line. The beer is made with an interesting mix of hops which (according to the NB website) include Delta, Bravo, Centennial, Cascade, Calypso, Mosaic. Some of these are familiar to me, but there are a few varieties (Calypso and Delta) which I have never heard of. I picked up three of these when in Chicago for Sukkos and enjoyed two with family in the sukkah and brought this one back. The two were consumed with roasts and were not overwhelmed by the rich meats. This is a beer which holds it own with a steak and has complex and deep flavors, slightly reminiscent of a barleywine. This is also not coincidental as the Voodoo Ranger Imperial IPA is 9% abv. The New Belgium Voodoo Ranger Imperial IPA is under kosher supervision by the Scroll-K/Va'ad of Denver, but not every brew produced by New Belgium is under kosher supervision. For a list of the New Belgium brews currently under supervision, please click on the link on the left side of my home page for my latest Kosher Beer List. To see what the experts on Beer Advocate think about The Voodoo Ranger IPA, click here beeradvocate.com/beer/profile/192/260043.